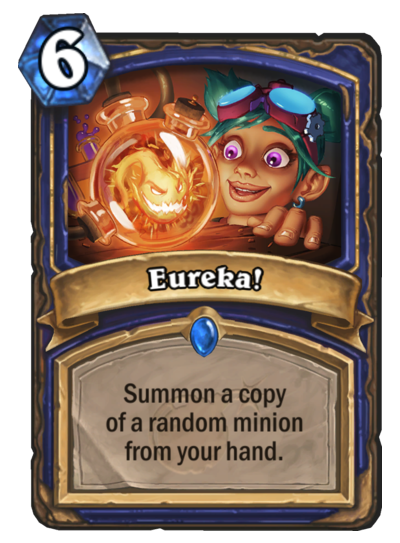 New Shaman spell will have you shouting "Eureka!" A new Shaman spell is the latest card revealed from Hearthstone's next expansion. It's the latest card unveiled from The Boomsday Project as the expansion draws ever nearer. Eureka! is a six mana Shaman spell. When you play this card, it summons a copy of a minion that you have in your hand chosen at random. If you're thinking Shudderwock Shaman, you need to lie down. Summoning a copy doesn't copy the Battlecry—but of course you knew that. Right now it's hard to see where this fits in a deck. Ancestor's Call Shaman was a fun gimmick back in the day, but it was never particularly good. It was a lot cheaper than this, too.